This content was created by Xtra’s branded content team alongside Intrepid Theatre, separate from Xtra’s editorial staff. Eddi Wilson loves to mix it up. The two-spirit Métis veterinary-technician-turned-performance-maker enjoys incorporating different artistic elements in their work, just as they’ve incorporated different identities into their life. 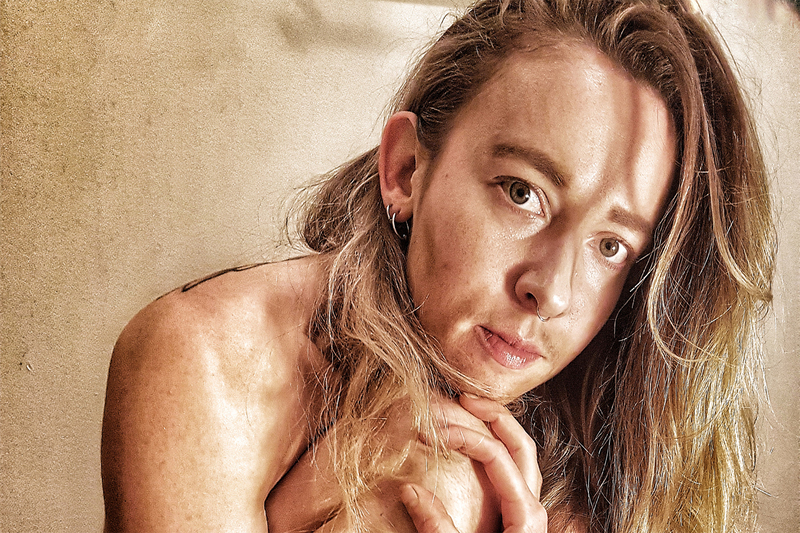 Wilson’s first solo show Animal Medicine premieres as part of Intrepid Theatre’s OUTstages Festival — a program of queer-focused works by creators from across Canada. This year’s lineup includes work from Zee Zee Theatre, the Queer Songbook Orchestra, and Toronto drag sensation Pearle Harbour, among others. An “autobiographical confessional abstract reality show,” the piece draws on Wilson’s many streams of experience as Métis, two-spirit and queer, but also as a veterinary technician. The child of a musician and a painter, Wilson grew up in Sidney, BC (a small town 30 minutes north of Victoria). Though it was a beautiful part of the country, it was a somewhat limiting place for both queer and creatively-minded types. After moving to Victoria, Wilson initially did a diploma in communications, hoping to get into something related to arts and culture. But the practical realities of life kicked in and a more stable career seemed like a better idea. But what exactly would that be? The answer came as the result of a spontaneous move to Montreal, albeit indirectly. Craving a radically different life experience that wouldn’t require applying for a visa, Wilson packed up and headed east shortly after graduation. Like many Anglophones before, they landed in La Belle Provence with visions of a bohemian paradise and next to no knowledge of French. Rather than end up as a telemarketer (as often happens to unilingual Montrealers) Wilson managed to unexpectedly score a job in a pet store. Three years later, Wilson ended up moving back to Victoria. Their father had been diagnosed with cancer and needed support while navigating the effects of chemo. Wilson continued to work in various animal-related jobs, before finally going back to school full time as a veterinary technician in 2014. Gainfully employed in the sector shortly after graduating, Wilson seemed poised to settle into a life of veterinary bliss. But while veterinary practice was satisfying, they found art emerging in daily life in unexpected ways. One of Wilson’s primary tasks at the clinic was caring for animals pre- and post-surgery. Like humans, when animals come out of anaesthesia they’re often highly disoriented, confused and in pain. Unlike humans, they can’t be informed of what they’ll experience in advance, meaning they need other methods of helping them through the process. To help ease their discomfort, Wilson would often try to soothe patients by singing little improvised songs. This relationship between creativity and care was part of Animal Medicine’s genesis. The show operates within the loose construct that the audience is a patient coming in for surgery. Wilson describes it a bit like an anaesthetic dream, playing with the concept of dysphoria as applied to gender and body, but also to the opioid-induced variety experienced in medical settings. At the core of the piece is our relationship with animals, understood from both European and Indigenous perspectives. While European cultures (largely thanks to Christianity) typically position humans as superior overlords to all other creatures, Indigenous cultures tend to have a much more modest view of our species, seeing us as just another part of a complex system. Like its creator, Animal Medicine resists easy definition. Mixing monologue and music with video projects and puppet shows, is a melange of the many things Wilson is interested in.